About a month ago, I fell in love with this shower curtain from Anthropologie. Beautiful, yes? I thought it would be pretty easy to reproduce this look, and when I saw that my local fabric shop had a huge sale on solids, I had to go for it! The original shower curtain retails for about $118 at Anthropologie, and I paid around $30 for all of my materials. I don't have many photos for this tutorial, because honestly I didn't plan on it being one. 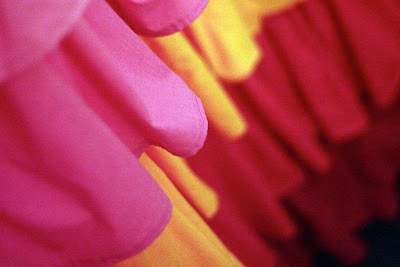 I wish I had taken more because with all the fabric and ruffles, it was quite the monstrosity to sew! Meaning-I don't think I'll be sewing another. Also, I didn't get a serger until after I made this shower curtain. Sewing the hems and gathers on all of the ruffles definitely put me and ruffles on bad terms. 1. Pre-wash and press all fabric. This is a MUST because you don't want this shrinking up after you've sewn the whole thing. 2. Out of the ruffle fabrics, cut strips from salvage to salvage measuring 8 1/2"high. You are going to want to make as may strips as you can from your yardage. Sew the ends together to make one nice, long row. 3. If you have a serger, consider yourself lucky and serge away at this bottom edge! If not, I feel your pain! You are going to have to turn the bottom edge to the wrong side 1/4" and press. Fold the edge over again, 1/4" and press. Take this to your machine and sew the hem with 1/8" seam allowance. 4. At the top of the ruffle, sew a basting stitch with 1/4" seam allowance. Sew another with 3/4" seam allowance. Cinch the ruffle up and set aside. 5. 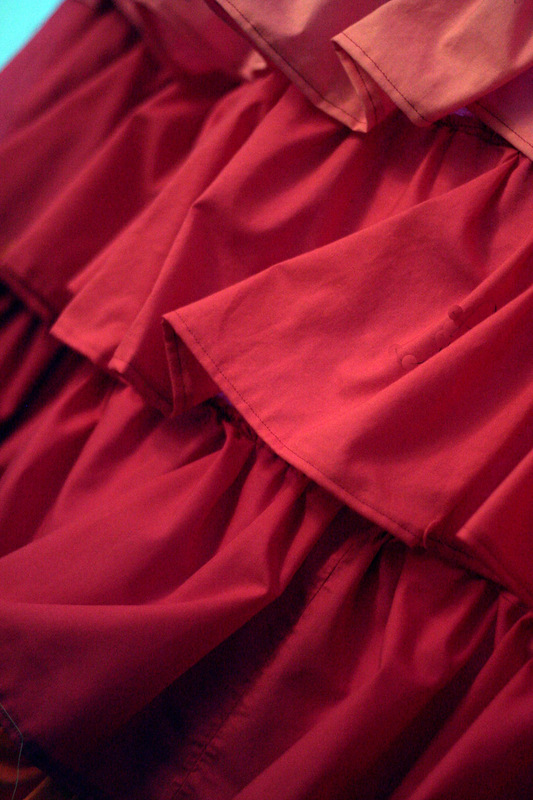 Repeat steps 2-4 to all the ruffle pieces. 6. For the backing, you are going to make one nice big square measuring 72" x 72". To do this, cut the five yards in half, so 2 1/2 yards each and sew them together with a 1/2" seam allowance. 7. Press the seam open. 9. 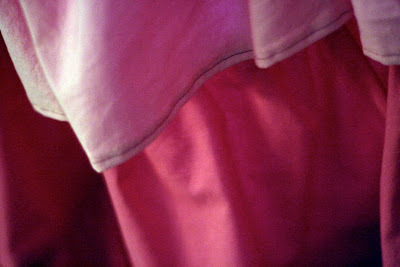 Lay your piece of interfacing, 2 3/4" x 72" and on the wrong side of the fabric, lay it right up to that crease you just made. Iron it according to your manufacturer's instructions. 10. Fold that 3" of fabric over the interfacing you just attached and press. Pin into place. 11. Sew this flap with 1/8" seam allowance. 12. Now, measure down from the top of your curtain you have so far 73"
13. Fold the bottom edge up 1/2" towards the wrong side and press. Fold it 1/2" again and press. Sew this hem with 1/4" seam allowance. 14. Finish the sides of the base of this curtain in the same manner. Folding the edges over towards the wrong side, pressing, and sewing. 15. Finishing the top-I chose to use buttonholes to finish the top of my curtain. I've found that liners tend to vary, so it would be best to lay your liner over the top of your curtain base and mark where you would like each buttonhole to go. 16. Add each buttonhole to the top of your curtain base. 18. 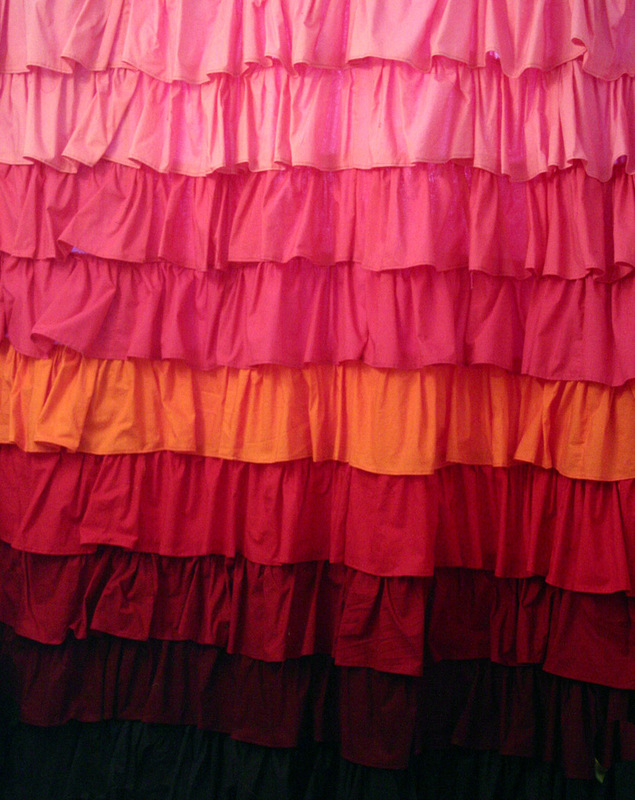 Begin with the bottom ruffle and adjust the gather to fit the width of your finished curtain base. Pin into place. 19. Baste the ruffle into place, then secure it with 3/8" seam allowance. 22. That's it! Hang that baby up and be in awe of the masterpiece you created for your bathroom! Finished Dimensions: approximately 72" x 72"
I don't know how you had the patience to do that! It looks AMAZING! I absolutely LOVE it! Awesome job! Amazing! I have been looking for a tutorial for this. That is beautiful! oh my! Someone was just talking to me about this the other day. GORGEOUS. well done! This is beautiful! I would have gone nuts dealing with all of those layers of ruffles. This is just amazing. I love the colors, the idea, everything!! I also featured it in my DIY roundup yesterday. Thanks so much for sharing!! Love this! 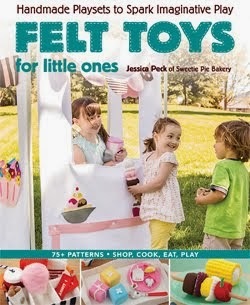 I am planning on making a few of these (the cheaters way) with frayed bottoms for a little gals party in just a few weeks. Your measurements really helped- thanks! saw this and ran out and thought i would take a hack at some curtains for my baby girl's room. i made up my own dimensions. i'm fairly new to serger-ing but it seems like the best possible gather i can achieve isn't going to make my ruffles ruffle-y enough. any chance you can tell me what your pre-ruffle fabric to ruffle ratio was? Love this!! 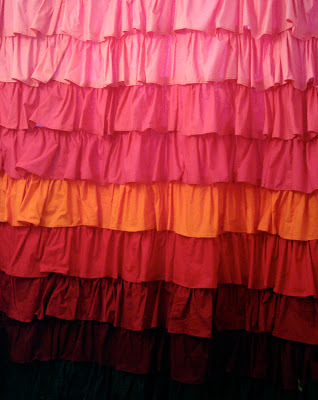 I am making a ruffle shower curtain for my daughter's new bathroom and something like this would be perfect:) I just wannat wrap myself up in it it's so gorgeous! Thank you so much for the tutorial! I too used it to help me create my own shower curtain, i LOVE it.. thanks for the help! This is awesome. It looks just like the original. I know you see something and think you can do it much cheaper then you get into it and wow but when you are done you can say I DID IT! Beautiful job. I looked at the original and you can't tell the difference. Stand up and be proud!! You did a good Job! I made the waterfall ruffle window curtain out of old sheets I cut up and dyed, so I feel you on the sewing all the ruffles! Mine was a pain also! Love, love, ADORE it! Rock on! so your first picture has yellow in it - did you make one with yellow? if so, i'd love to see it. those are the colors i want to put in my girls' bathroom. thanks for this great tutorial! Nice work (from someone in the sewing biz)! If you love ruffles, you must learn to use a narrow hemmer foot. Sergers are okay for this but will leave a utility/unfinished look (better than none at all). The use of a narrow hemmer foot will set you free!!! Give it a try. 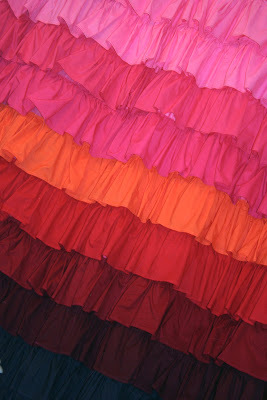 You'll be glad you did then ANY ruffle project will be lots of fun! Ruffles never go out of vogue, they just move around in different places. Happy ruffling!!! This is plum perty! Great job! What a gorgeous look.So smart! Fantastic! You've inspired me to make my own shower curtain. Also learned something, a ruffle foot, hmmm I'll have to check that out. Fantabulous !! What endurance ! What a payoff. Totally awesome! For my shower I will have to make it a little longer than 72" (I have a wheel-in shower since I am a full time wheelchair user) so will have to re-figure your measurements to make it 80"w X 90" l but I can totally see this done in blues for my bathroom. What did you use for backing? and where did you use the interfacing? Coverting this into a smaller piece and making a maxi skirt. Love this! It looks great!! Now I really miss my industrial Serger!! !